Your child's first visit should be a great experience. Our staff will provide a comfortable environment, allowing your child to become excited about the next visit to the dentist. Before visiting a dentist, it helps to know what to expect. At Clifton Pediatric Dental Care, we understand the importance of having a safe and comfortable dental experience. By scheduling an appointment or stopping by, you and your child can tour the practice, meet the staff, learn more about the services available and get familiarized with the office. Now, the big question: when to go? The American Academy of Pediatric Dentistry (AAPD) states that your child should visit the dentist by his or her first birthday. When you come in, we will make sure to engage and interact with your child to get rid of any fear or apprehension. The earlier you bring your child in, the better. See our collection of suggested reading for parents and children about the first visit to the dentist, loosing a tooth, healthy dental practices, and more. 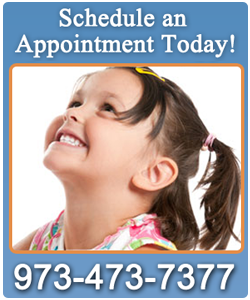 Your child's first dental appointment at Clifton Pediatric Dental Care will be short and sweet. It is more of an informal meet and greet for the doctor and patient, allowing them to get acquainted with one another. You may be asked to hold your child while the dentist checks his or her mouth and counts teeth. The dental inspection will go as follows: Dr. Sugarman will check your child's gums, jaw and bite. If the teeth are stained or there appears to be a risk of cavities, a fluoride preparation may be applied. We will discuss oral-hygiene practice and give you the opportunity to ask us anything regarding your toddler's oral health. After the first visit, Dr. Sugarman will let you know when to come back again. The rule of thumb is every six months, but it depends on the condition of your child's teeth.